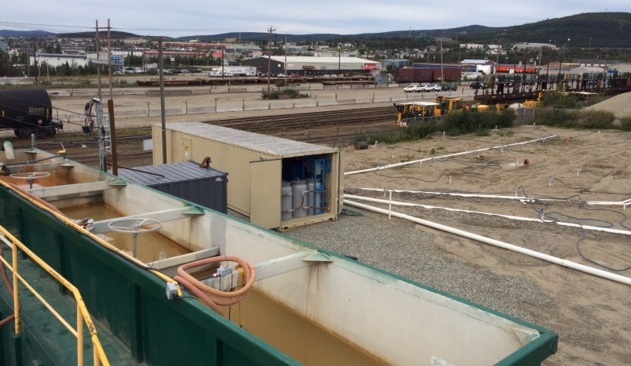 Bioremediation — The use of biological processes to treat contaminants at an impacted site. Bioslurping — Synonymous with MPE, MPVE. An extraction technology that combines bioventing and vacuum-enhanced liquid recovery to remediate groundwater and subsurface media. Multiple phases of contamination are removed from the subsurface via one recovery stream. Contaminant of Concern (COC) — Chemicals which pose a risk to human health and the environment, categorization is achieved through Risk Based Analysis. Contaminated Site – Various areas or media in the environment that have been impacted by chemical or physical pollutants in exceedance of applicable standards or guidelines. Examples of impacted sites range from soils to surface water to ambient air, etc. Contaminated Site Remediation — The act of reclaiming sites that have been contaminated with pollutants from past user practices. The goal being to mitigate negative impacts and return value/usability to the impacted site. Dense Non-Aqueous Phase Liquid (DNAPL) — A liquid that has low solubility in water and is denser than water. Tends to remain the in the liquid phase and sink underneath the water table. E.g. trichloroethylene. Dual Phase — Refers to the use of two extraction streams to treat the subsurface environment at a contaminated site. Liquid removal via pumping and gaseous extraction via vacuum. Dual Phase extraction (DPE) — See Dual Phase Vacuum Extraction (DPVE). 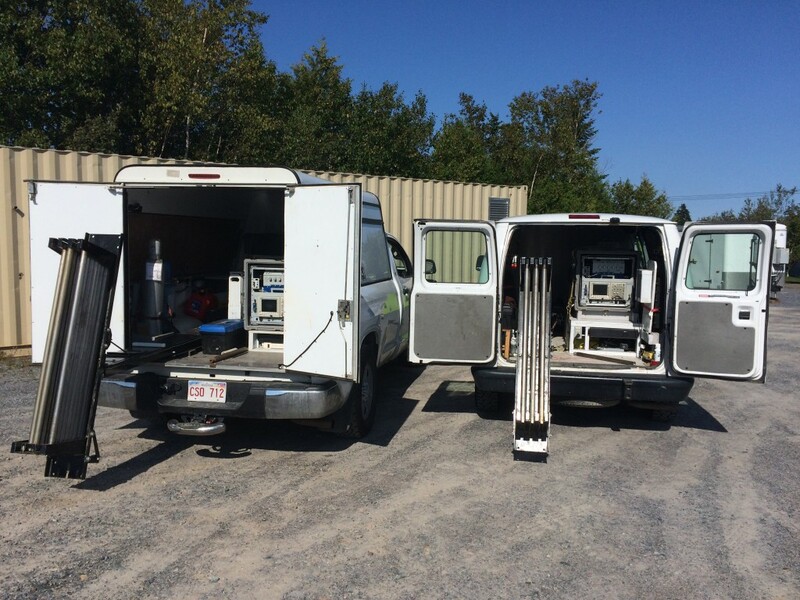 Dual Phase Vacuum Extraction (DPVE) – An extraction technology that uses two extraction streams to remediate the groundwater and subsurface media. Can be used in congruence with other technologies to improve remediation success. Environmental Remediation — Refers to the removal of contaminants and pollution from impacted sites as well as the mitigation of their negative effects. Environmental Remediation is conducted with the general goal of protecting Human Health and the Environment. Environmental Remediation Contractors — A Business that specializes in the treatment, remediation and recovery of sites that have been impacted by various environmental pollutants. These contractors must have an intricate understanding of the many applicable sciences and technologies. Environmental Equipment Manufacturer — A Business that constructs various equipment that has been engineered to help environmental remediation contractors achieve their contaminated site remediation goals. Environmental Remediation Technologies — The skills, techniques, equipment, methodologies and systems that environmental remediation contractors will employ when actively mitigating the various environmental impacts present at contaminated sites. Environmental Remediation Technology Provider(s) — A broad group that encompasses both manufactures and applicators of environmental remediation technologies. Extraction – The act of obtaining from a substance from various compounds and mixtures using chemical, mechanical or manual means. Free Product Recovery — The act of removing the remaining liquid phase contaminant from various media holding it. Light Non-Aqueous Phase Liquid (LNAPL) — A liquid with low solubility in water and that is less dense then water. Tends to float in the liquid phase on the surface of the water table. E.g. gasoline. Multi-Phase — Refers to the use of one recovery stream to treat the subsurface environment at a contaminated site. Both Liquid and gas phase contaminants are extracted through the same recovery stream. Multi-Phase Extraction (MPE) — See Multi-Phase Vacuum Extraction (MPVE). Multi-Phase Vacuum Extraction (MPVE) — Synonymous with Bioslurping. Refers to the extraction of subsurface contaminants through one recovery stream using a vacuum gradient. Can be used in congruence with other technologies to improve remediation success. Non-Aqueous Phase Liquid (NAPL) — Liquid contaminants that have a low solubility in water and as such tend to stay as “Free Product”. Two categorizes exist (LNALP) and (DNAPL). Pay for Performance Remediation (PFP) Contract — Remediation that pays out incrementally from a total fixed price as measurable contaminant reduction goals are achieved. Encourages fast and efficient results. Performance Based Remediation Contract (PBC, PBR) — Contract where pay is based on reaching certain standards of performance. Pay can be based on a Firm Fixed Price contract (FFP), Guaranteed Fixed Price Remediation Contract (GFPR) or another contract vehicle. Petroleum Recovery — Removal of petroleum and associated chemical species from an environmental media. Petroleum Remediation — Mitigation of the negative impacts associated with Petroleum contamination in environmental media, may include Petroleum recovery. Petroleum Remediation Contractor — A Business that offers specialized environmental services geared towards treating Petroleum contaminated sites. Product Recovery Technologies — Refers to the use of various environmental remediation technologies to recover the “Free Phase” contaminant from an impacted site. See Product Recovery. Product Recovery – Deals with the “Free Phase”, recovery of the contaminant mass that has yet to partition into other phases in the various environmental media. Remediation Contractors — See Environmental Remediation Contractors. Remediation Systems — A combination of equipment, machines and methodologies that work together to achieve a remediation success. An example being MPE systems or SVE systems. Semi-Volatile Organic Compounds (SVOC) — Are related to VOCs in that they also have high vapour pressure (low boiling point) but are generally slower to volatilize then VOCs for various reasons — molecular weight, chemical bonding, etc. Site Remediation — See Environmental Remediation. Soil Vapour Extraction (SVE) — The use of a vacuum gradient to remove the gaseous phase of a contaminant, also stimulates Bioremediation. Can be used in congruence with other technologies to achieve remediation success. Vacuum Extraction — The use of a vacuum gradient to induce the movement and extraction of the contaminants at a given site. Vapour Abatement — The reduction in concentration of gaseous pollutants. Can be achieved through several processes including SVE, Vapour Intrusion Mitigation (VIM), and other applicable technologies. Volatile Organic Compounds (VOCs) — Organic chemicals with a high vapour pressure (low boiling point) that readily partition to the gaseous phase.